Owning a motorhome is enjoyable and can be a great adventure but as with many things there is a lot of preparation and work that goes into maintaining it. 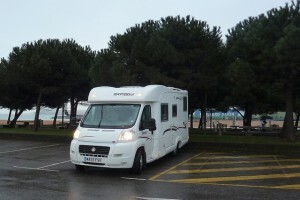 Many owners are fanatics and enjoy travelling all year round, rain or shine. However many will pack up their stuff and leave their motorhome stationary until the sun starts shining again. We have previously spoken about weatherproofing your motorhome so now we are giving you some tips on how to prepare your stationary motorhome for the winter weather. Ahead of the cold weather make sure to wash the exterior of your motorhome and cover it with a few coats of wax which will give added shine and protection from scratches. Don’t forget the roof when cleaning your motorhome because that is often the part of the vehicle that gets dirtiest. Cover up any vents on your motorhome to prevent any insects, dirt or mud getting into them. You can buy vent covers at most online caravan or motorhome shops. To prevent any electrical components from rusting you should cover them in lubricant. In the summer when the motorhome is in use, all windows should be left open whilst cooking or showering. In the winter occasionally open up windows and doors to air out the interior. Drain the waste tank, toilet cassette and any remaining water inside the motorhome. Empty each container thoroughly; turn on and off any taps and drive you van around to move any left over water. Do not forget the water heater; there will be instructions to follow explaining how to drain the water correctly. Especially in the winter, stationary tyres are at much more of a risk than ones that are used on a regular basis. This is worse with tyres on motorhomes because of the weight on the vehicle therefore jack up the vehicle slightly to relieve some pressure from the tyres. You can also purchase motorhome tyre covers which will protect the wheels. When it comes to driving your vehicle again do NOT just drive of and expect everything to be fine. Carefully check the tyres in case there are any less obvious signs of damage like small cracks. If you plan to travel in your motorhome during the winter ensure you research whether you will need winter tyres in the country you visit because they are often required by law. If you are planning on not touching your vehicle for the winter you must tell the DVLA that it is not in use and declare it as Statutory Off-Road Notice (SORN). However if you motorhome is declared SORN you are not covered in the event of any theft or damage on your motorhome. Speak to your insurer for information on what to do and tell them where you are leaving the motorhome because it may be worth keeping your motorhome insurance. Sign your motorhome up to a register on a computerised system such as Minder because if you were to be unfortunate enough for you motorhome to get stolen it is logger with all the details. Keep any details that you register up to date then if anything was to happen the police will begin to get your motorhome recovered. There are many websites offering information and advice for motorhome owners. It may also be worth getting your motorhome fitted with a security system to reduce the risk of theft. Even if you don’t want to travel in your motorhome in the winter try taking it for short journeys just to keep it working. Just like humans, if you stop using your motorhome it will forget how to work! However, don’t do this if your motorhome has been declared SORN, remember to get motorhome insurance.